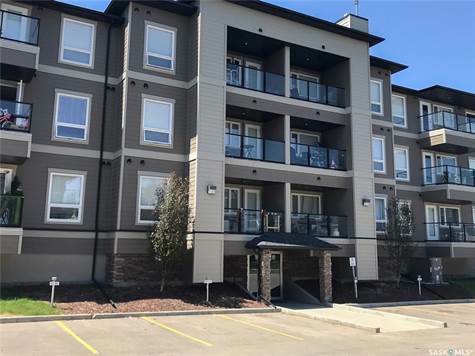 Built by Northridge Developments, this Serenity Pointe condo shows like new and is move in ready. The main living area has attractive laminate flooring, tasteful finishes and large west facing windows that fill the open concept floor plan with natural light. A well planned kitchen comes with stainless appliances including a built in dishwasher and OTR microwave. There are two bedrooms, a main four piece bath with the master having a three piece ensuite with double shower and a large walk in closet. A convenient in-suite laundry room comes with the washer and dryer and has ample storage space. This condo features zoned in floor heating and central air conditioning for year round comfort. A garden door in the living room gives access to the west facing balcony. There is ample parking with one underground stall and one surface stall. The building is wheelchair accessible with a central elevator and is located just steps to the park, bus stops and all the amenities that Stonebridge offers.